Memorial Day has come and it's official that summer is in full force! Though I'm the first to admit I'm not a fan of heat and humidity (so why do I live in St. Louis?! ), I am a fan of a summer atmosphere. BBQs, cold beer, Cardinals games, etc. I am definitely not a master griller, but without a doubt my favorite thing to grill is pizza. When I mention to people that we're going to grill pizza they look at me like I have a second head or something. But, man-oh-man, I could eat grilled pizza every day! Though it seems hard to do, and time consuming, based on the instructions below, believe me - it's not. You can make it even easier too by using a store-bought dough! I've been on a homemade pizza kick lately because I think it's so easy when you allow yourself enough time, but the convenience factor of store-bought just can't be beat, especially now that so many grocery stores are really stepping up their prepared foods. There are a few different ways to grill a pizza. You can grill on a pizza stone, directly on the rack, or like I recently did when entertaining - on the rack using par-baked dough. I like grilling directly on the rack so that I get beautiful grill marks, but whatever floats your boat will work! In bowl of a stand mixer fitted with the dough hook, add flour, yeast and salt. (If you forgot to make the dough the night before, use 2 1/4 tsp instant yeast here). Turn mixer on low and while running add honey and water. Slowly add olive oil until dough just comes together around the hook (will still be lots of "pieces" of dough around the work bowl). Turn mixer off and turn all dough out onto counter. Using hands, pull dough together with a few throws against the counter (Dough should be very supple in texture, not oily or dry. Depending on temperature, humidity, etc you may need a 1/2 tsp or so more water or flour. Add it now if needed). Knead for about a minute to create a ball of dough. Remove dough from fridge and place on counter to come to room temperature. If making personal 8-10 inch pizzas, divide dough into 4 equal pieces. Using either a pizza peel, or parchment paper sprinkled lightly with cornmeal, shape the dough using lightly floured hands. Place large, grill-safe, pizza stone directly on the grill, heating over medium-high heat for 30 minutes. Top your pizza with your favorite sauce, toppings and cheese. Transfer your pizza to the heated stone. If you're using parchment paper, make sure to slide a cutting board or non-rimmed cookie sheet, underneath for added support. Bake until edges of dough are golden and cheese is melted, about 10 minutes, tops. Remove with a pizza peel or cutting board and allow to sit for about 3 minutes before cutting. 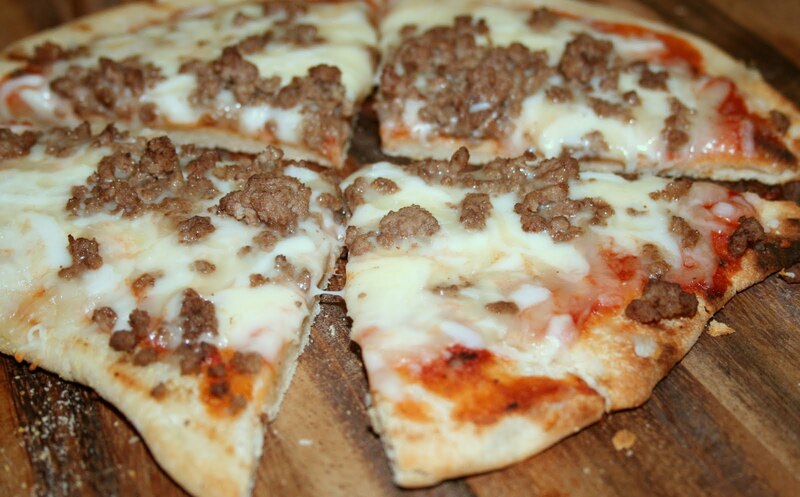 Heat the grill to medium heat and while warming, prepare everything you need (baking sheet of pizza dough rounds - I recommend more "personal" size pizzas if grilling directly on the grate - sauce, cheese and toppings). Place the pizzas directly on the grill, allowing the dough to cook with a closed grill for about 5-8 minutes, depending on thickness. Flip the dough and top the cooked side with sauce, toppings and cheese. Close the lid and cook another 5-8 minutes, or until the bottom is grilled and the cheese is melted. Place large pizza stone on the lowest oven rack position and heat at 450 degrees for 30 minutes. Transfer dough to the pizza stone using the pizza peel or parchment topped thick surface. Bake about 5 minutes until dough is starting to set. Remove par-baked dough to a pizza peel or cookie sheet to take out to your grill. Place the pizzas directly on the grill heated to medium, allowing the dough to cook with a closed grill for about 4-5 minutes, depending on thickness. Flip the dough and top the cooked side with sauce, toppings and cheese. Close the lid and cook another 4-5 minutes, or until the bottom is grilled and the cheese is melted. 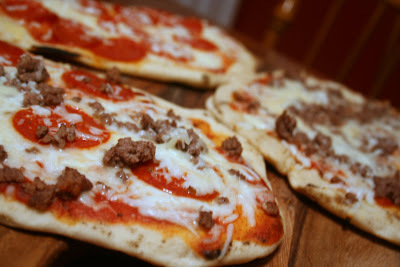 grilled pizza is one of our favorite summer meals---by far the best discovery of summer 2009! Yours looks delicious!